It's out! The October issue of Minnesota Women's Press--with my painting Force of Nature gracing the cover--is hitting the newstand today! I've been anxiously waiting for these final September days to pass so that I could finally see this issue out in print. No, I did not see an advance issue. Early in September I did the interview with the Women's Press editor Norma Jean Olson. Interviews are not an everyday kind of thing for me, so I was a little nervous during the interview (which was done over the phone). O.k. I was very nervous. But also very excited. Once the interview was done, I had to wait...and wait. Believe me, I thought about it alot...wondering what the cover would look like, thinking about what the article/interview would say...I knew that the article would talk quite a bit about how my first marriage was abusive. It's a little hard being that vulnerable and open to the public, but I'm o.k. with that. For starters, I left my first husband over 20 years ago (he's now deceased)...I've had many years to put the whole experience in perspective. And the important message that I wanted to put out there was that I not only survived the experience, but I am thriving. Making art has been an important part of my healing. I am a stronger woman having gone through that experience. Now I don't think that any person should have to go through that kind of experience to become stronger, but I'm proud of how I weathered that personal storm and have grown from it. 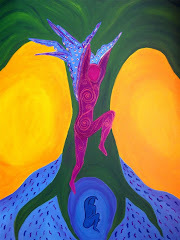 It is a part of my life experiences and those experiences do have an impact on my art. I also hope that other woman who may have faced or are facing similar experience can benefit from reading my story and how my life has turned around. I am excited about my life today and feel fortunate that I am able to pursue my dreams. So that said, I am very happy with the article and now can sit back and enjoy it. My wonderful, supportive husband called me this morning to tell me that he had spotted the October issue at the St. Paul coffee shop next to our home (and he grabbed several copies). Knowing it would drive me crazy to wait all day to see it, I set out on a journey to find my own copy. After stopping at six different Mpls coffeeshops (and coming up empty), I finally headed over to the Women's Press office and grabbed a few copies. (A friend has since found the issue at a Mpls coffeeshop). I came back to work and excitedly shared it with co-workers. It's a "pinch-me-is-this-real" sort of day. So if you live in Mpls/St. Paul area and haven't found a copy yet, I hope you will check it out (look for it at local coffeeshops and libraries). For those not in the area, click here to read the article. It's crunch time...Just two weeks till the Art Crawl--which means I'm painting like crazy over at the Jax studio. The above series of paintings (working title "Seasons") includes just a few of the canvases I'm working on and hoping to finish before the Crawl. I was working on 4-5 different canvases today (including 2 of the above)--painting at two different tables, music playing, and having a good time. Sometimes working with a deadline and that sort of intensity helps get the creative juices flowing. Today it was working that way. It felt so-o-o good. And on a positive note...after several scary days, my stepdaughter's health is improving. She's awake and off the ventilator. Hopefully, she'll be out of the hospital soon. Thank you everyone for your support. This week started with such promise. I had not spent as much time as I hoped in the studio this past weekend, but enough to recharge me. I was feeling a little stuck, but out of the blue on Monday morning--well, at Starbucks really, I was struck with inspiration for one of the paintings I was working on. Sometimes inspiration is like that...you're out running errands, talking to a friend, baking cookies, whatever...and you see something or your head clears and new ideas come to you. Totally unexpected, but a delight nonetheless. It's energizing. Motivating. So off to work I went, caffeinated and ready to breeze thru my work day or so I thought. 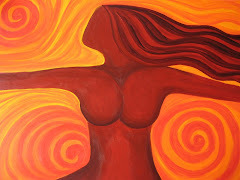 I couldn't wait to get thru the day and head to the studio and paint that inspired idea out on canvas. But this week has already taken a few twists and turns I wasn't expecting. First off, and most significantly, my step daughter went in for scheduled surgery on Monday. It should have been a routine procedure. Instead there were complications and nothing seems routine now. Right now her body is trying to mend and needs some time to heal. Hopefully things will look brighter tomorrow. It was/is a reminder that life throws you unexpected curveballs. Throw on top of that the stresses of my full-time job as a social worker. Most days I enjoy my job and feel that I am doing something meaningful. I enjoy the relationships that I have with the people I work with. But the past few weeks have felt more difficult. Sometimes it is just plain hard to hear over and over again how difficult life can be for folks...and to feel like there's not much you can do to make things better. Sometimes I just don't have answers and I'm at a loss for how to even be encouraging. I guess I'm feeling a bit discouraged. And tired. It's hard to come home and feel inspired. But when life seems hard, art is my solace. Viewing art or making art is a reminder of how beautiful life can be--even when things are rough. So I try to spend time in my studio. Because there I can relax. Unwind. Disconnect. Create great stuff. It's hard finding the motivation, but once I get to the studio and start working the stress just sort of evaporates and I feel more at ease with the world. I feel good about things again. Struggling with a bit of "painter's block"...feeling that urge to paint with the pressure of the art crawl deadline (just 3 weeks away) sort of stopping the flow of things. This was one of those days when too many ideas seemed to be flooding my brain and I just couldn't figure out where to start. Sometimes it's good just to sit in my studio, listen to music, journal, and think about the things I want to work on. And sometimes I just need to pick up the brush and paint. Anything. I got a late start today. I'm determined to get going early tomorrow and just pick up the brush and roll with whatever the muse delivers! On a positive note, my postcards came today! For the first time I ordered postcards to use as a promotional tool. I will send some out before the art crawl, drop some off at coffeeshops...and have them out at the art crawl for visitors to grap. On the front is an image of one of my paintings (the one to soon be featured in MN Women's Press) and on the back are the dates for the Fall & Spring Art Crawls. I love grabbing postcards when I go to galleries/open studios. It's just another way to help people remember my work (and maybe decide to buy something!). Doing this sort of thing makes me feel so much more professional. I'm off to celebrate the day with my hubby! We're off to enjoy an afternoon baseball game (GO TWINS! ), find some cake and just enjoy a relaxing day. Joel and I met thru our love of baseball and we also share a passion for art. Joel used to dabble in theater (I think he still loves to act...he puts on a performance daily!) and he is still a writer. He wholeheartedly supports me in pursuing my art. I cannot tell you what a huge difference that makes! He does not begrudge the time I spend over at the studio painting, in fact, he encourages it. He encourages me and even gives me a little push when I need it. So, Happy Birthday to my biggest fan! I love you! With Labor Day (and my vacation) past, I am back to the routine of dredging off to work during the day and hopefully stealing a little studio time in the evening. This has been a busy week at work--the start of a new program year. I work for a therapeutic preschool and like the public school system we kick off a new school year after Labor Day. This means staff training, completing intakes with new families and re-connecting with "old" families. Not much energy for creating when I get home! But since I got home a little earlier, I thought it would be a perfect evening to soak up a little artful inspiration. Joel was willing to head over to NE Mpls for "First Thursday"--an evening when several studio buildings in the Northeast neighborhood are open to the public. We drove thru some heavy traffic to arrive at the Casket Arts Building, hoping to check out a new spot. I noticed that it seemed a little quiet. 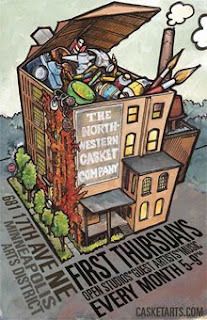 After checking one door and finding it locked, and then heading to another door, I commented, "I will be really ticked if we drove over here to find nothing going on for First Thursday". And with that, a lightbulb went off in Joel's head...yes, my brighter-than-me readers, it wasn't first Thursday...it was second Thursday...and it was quiet, because there was nothing going on. Oh well, I chalked it up to it being a busy week. Determined to still enjoy an evening of art, we headed to the Mpls Institute of Arts--my favorite local art museum. We topped off the evening with a trip to Izzy's for a little ice cream. So not quite the evening I had imagined, but inspiring nonetheless. 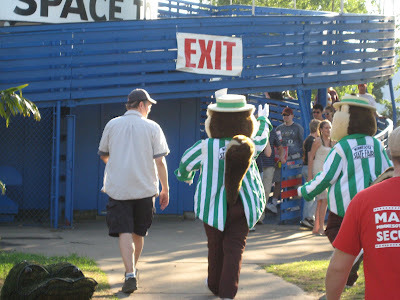 Today marks the end of the Minnesota State Fair. Joel and I will make our final trip of the year (Trip #5). It's been a wonderful 12 days of the fair--I've been on vacation the whole time! Beautiful temps (highs in the upper 70s/lower 80s), sunny, no rain...we are sliding into beautiful autumn weather. I can't believe that the summer is over...the season we long for throughout the long, cold winter is gone in a flash. But really, I love this time of year the most...the temperatures are much more tolerable, there's less humidity...time seems to slow down just a bit. It is a time of transition...there is a sense that things are about to change. I feel that way too. We are feeling more settled in out studio--spent much of this weekend working on home projects (pics soon). I'm feeling good things are happening with my art. Friday night we attended the opening reception for the Savoring Summer show at the AZ gallery. My Ode to Izzy's painting is in the show. It may be hanging in a less than desirable spot, but hey, I entered the competition and was accepted...that alone was a victory to celebrate. Last week I was also interviewed for an article in the MN Women's Press. I will be their featured cover artist in October. I am over the moon in excitement. This is a Minnesota newsmagazine, published monthly, with the tagline "changing the universe through women's stories". I have read this publication for over 25 years and to have one of my paintings featured on their cover...BIG STUFF. I have been quiet about this, because I haven't wanted to jinx it...but now that the interview is done, I think I can let my excitement out a bit. Believe me, when I see the cover for the first time you will hear me squealing with excitement! And not only will it be available in print, you will all get to see it online! It's all making me feel better about taking some risks...which makes me want to take more risks. Sometimes when we try something new, it doesn't work out...but we never know unless we try...and when it does work out, it feels so very sweet. So, I'm hoping you are all enjoying your Labor Day Weekend. Savor this "last day" of summer. I know I am. Tomorrow's the last day of the Fair and we'll be there for one final trip. Hope these little ones have already made the trip home with their mommas. Beautiful flowers at the Fair. Simply couldn't pick just one! Well, I feel like I owe you a few pics, since I missed yesterday--but I was at the Fair! Here are a few pics from our evening stroll thru the Midway, otherwise known as the land of the Big Bananas! 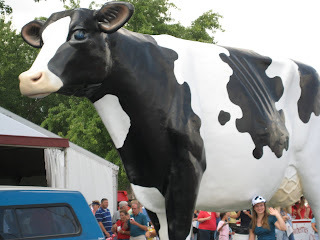 Continuing with the parade theme...where else but Minnesota would you have a enormous cow as part of your daily Fair parade? O.k. Wisconsin would probably do that too.